Today's acronym is CAS which could actually stand for the same as yesterday's card but in fact this time it is 'clean and simple'. Quite often a CAS card is only one layer but this isn't necessarily so, provided it has plenty of white space and isn't overly decorated. 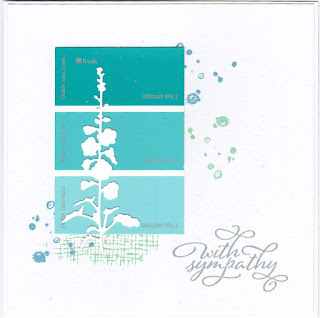 Using a Misti or something similar certainly helps with this style of card, particularly when it comes to placing a sentiment direct onto the card - something I always used to avoid because I found when I was actually trying hard to get it right something invariably went wrong by way of a smudged or badly stamped image and the card ended in the bin. For this card I used a paint sample card, easily picked up from the DIY stores and in a good range of colours. A few 'splodges' were stamped onto the background before popping on the paint sample and a die cut wild flower. Finally a sentiment was stamped - that's it a CAS card and with no smudged fingerprints!! I could maybe get used to this style but I do like to work in whatever takes my fancy from time to time - variety is the spice of life. This is beautiful Val, great use of the paint sample as a backdrop to this gorgeous die. Unlike yesterday .. .. I did actually know the meaning of this acronym LOL!. Love this card very much. Great use of the paint samples. I agree .. .. it is nice to work in lots of styles. Mine seems to change daily! love this Val...so gorgeous!! so creative.